Paging and intercoms are excellent ways to manually ensure that the correct people are entering your building. 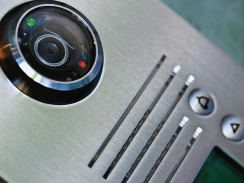 With an intercom system, a person identifies themselves, and a staff member will press an access control button on a master station to unlock a door or open an entry gate. We can integrate your paging system, intercom system, and access control system to work with video surveillance to provide a total security package for your business. We are your Milwaukee area intercom installation and repair experts with over 25 years of know-how and experience in installing and servicing the best access control systems throughout Wisconsin. Need to replace your old system? Kelley Communications can consult you on the best options for you. Depending on the upgrade, we can use your existing infrastructure, or we can run new cabling. We also can repair any problem with your current intercom from keypad replacement to amplifier and speaker fixes. We are your Milwaukee and greater Wisconsin area intercom repair and service experts! In addition, we can integrate into a comprehensive security plan for you. Security cameras can record security breaches, but how do you prevent it? Kelley Communications can install a variety of access control systems, which regulate who can enter and exit an area and are perfect for ensuring security. Take the worry out of who is coming and going at your workplace with a reliable, full color HD monitoring access control system. We have options that allow you to control doors, gates, and other entry areas with the push of a button. Trust Kelley Communications to install the best access control system for your needs!